The Burke Post Office was opened shortly after Burke was founded in the early 1880s. The first postmaster was H. R. Rhodes (perhaps Harris Rhodes) for whom the new town was originally named. The Post Office operated as full post office in the Burek & McCall Store building until 1955 when it was downgraded to a substation of the Diboll post office and moved to the Drew Holder store building. The closure of the full posti office probably resulted from cessation of railroad passenger service in 1955. It was the passenger train that brought the mail to Burke. The substation was closed permanently some time in the 1960s. 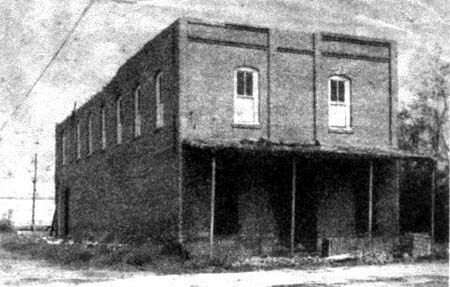 In the middle 1900's the post office was located in the corner of the two story brick Burke and McCall store building on the School Road facing the railroad track. By the 1950's the store was mostly defunct, selling only a few sacks of feed. Most of the display cases in the building were empty. The Masonic Lodge was located on the second floor of the building. Later when the old brick building was torn down, the postal substation was relocated to a small former store building across the railroad tracks on Old 59. For many years in the 1900s, the postmistress was the legendary Miss Ina McCall, descendant of of the area's pioneers, Mississippi native Daniel McCall. Miss Ina was friend to schoolchildren who waited to catch the school bus at the post office. One of Burke's first store owners. Early settler and owner of Burke Lumber Company and a store. Store clerk and brother of prosperous Lufkin merchant Calvin Mantooth. Co-owner with Lee Burke of Burke and McCall store. Also telegraph operator and station agent for HE&WT Railroad. Daughter of Daniel B. McCall. She was postmaster until the post office was downgraded to substation in 1955. The rural mail carrier in the 1950s and 1960s was R. Linval Campbell. Since his car was always on the move, some referred to him as "Rambling Linval." His brother-in-law, Drew Holder, substituted for him when he was not available. Campbell also ran a small store and Texaco gas station on U. S. 59 on the south end of Burke for many years. Prior to Campbell the mail carrier for many years was Wesley Theodore (Theary) Ryan. Pearl Havard remebers when she was very young, mail service at Beulah was from Homer. However, later it was changed to Burke, and she recalls Theary Ryan delivering mail to them. The second floor of the Post Office building was occupied by the Burke Masonic Lodge. The Lodge was a mystery to kids who hung around the Post Office afternoons waiting for the school bus. The second floor was accessible only via a set of stairs behind a locked door on the rear of the building, and the windows were painted over. The first public telephone service in Burke was at the Burke Post Office in a small alcove in the back of the building. The first telephone in a home was reportedly owned by Fayette and Tennie Havard.